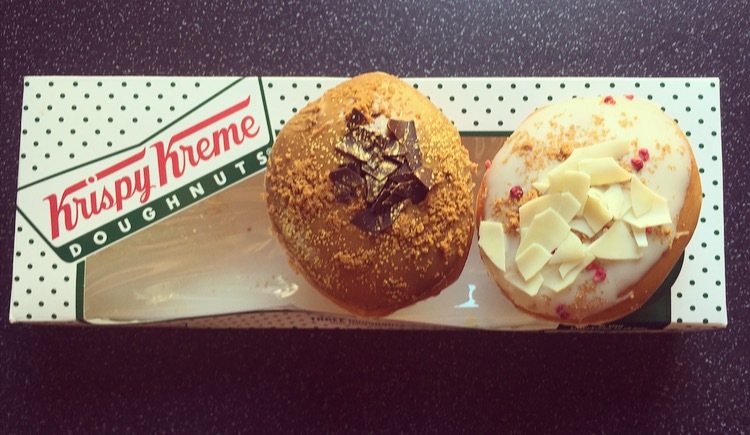 This week saw 2 new additions to the Krispy Kreme Lotus Doughnut Family – Lotus Billionaire & Lotus White Chocolate and Raspberry. 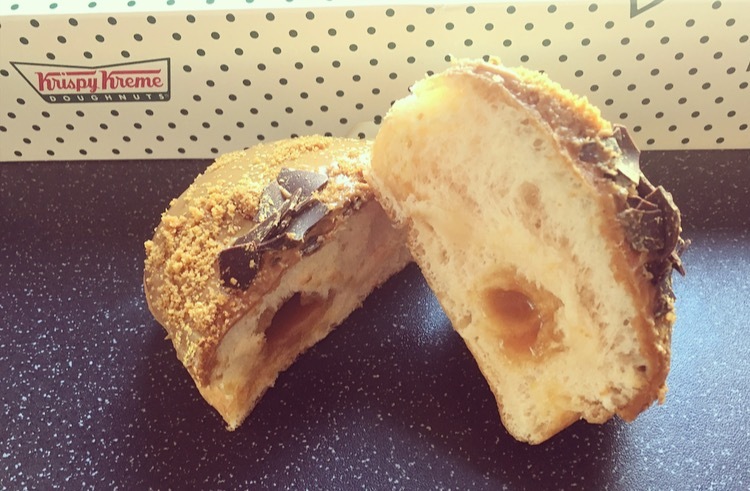 We all know that I think the original Krispy Kreme Lotus Biscoff Doughnut is like heaven in a doughy biscuity ball, however I have got to say I wasn’t all that bowled over by these two new additions. I am not alone here as my doughnut loving twin over at Reaching for Refreshment had the exact same thoughts and we decided not to rush out and buy them. So what changed? For both of us it involved our mothers! My dear mum moaned at me yesterday morning for having not bought them yet. I did politely remind here I am on a health kick however her response was a rather bold ‘yes I know but I can eat and review them instead’. So here we are with doughnuts in hand, and yes I did have some….. Well it would be rude not to. Out the two this certainly looked decadent with the gold topped dusting, who doesn’t love gold dusting!? 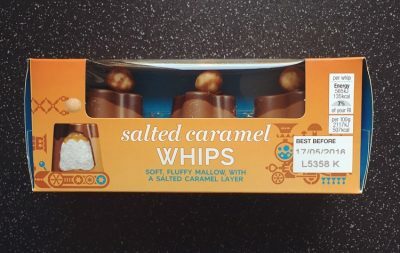 Slicing in first and foremost where is my puddle of joyful salted caramel filling? As you can see half of the doughnut had a 5p sized amount of caramel and the other had only a smidge more than that. The doughnut was of usual Krispy Kreme standard, light, fluffy and just the right amount of stodginess. The crumbled Lotus Biscoff crumb topping and shards of choclate gave it a contrasting crunch factor that helped cut through the sticky topping. The best thing of the whole doughnut was that thick hand-dipped Lotus Biscoff topping. This gave the doughnut a punch of creamy Biscoff flavour that was the gift that just kept on giving and made up for the lack of filling! 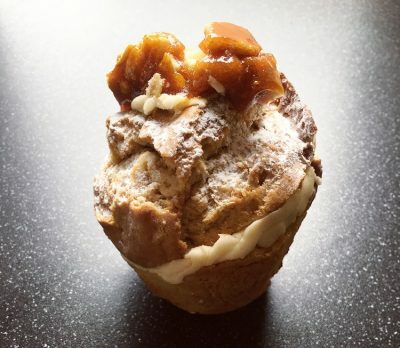 Talking of the measly caramel filling, it was gooey, perfect saltiness and reminded me of a Werther’s Original, it just needed more. Onto the fruity one. In stark comparison it oozed with raspberry filling that screamed lick me! The raspberry filling was certainly jammy like, was sweet yet slightly tart and certainly packed full of raspberry flavour. 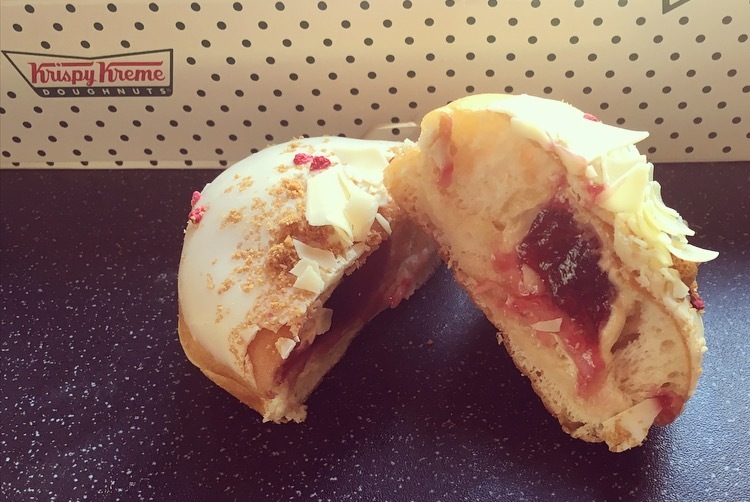 I would say the kreme needed to be mixed together with the jam because once you’d eaten the jam I was left with flavourless kreme. The white chocolate doesnt bring much to the table other than shattering and going everywhere. The raspberry pieces are merely for aesthetic purposes because the star of the raspberry show was certainly that jam. In terms of Biscoff flavour, well there isn’t any, I can’t say much more than that. There we have it the new Krispy Kreme Lotus additions. I like them both, ones fruity tooty and one is gooey and caramelly. If we are basing this on Lotus Biscoff then Billionaire’s is the only one out the two where you can taste it and certainly wins hands down. If you want something light and fruity go for the White Choc & Raspberry. If you want a big hit of indulgent Lotus Biscoff, Billionaire’s is the kiddy, and let’s be honest if you want a doughnut you may as well have a naughty indulgent one. What does however concern me is the consistency in Krispy Kreme Doughnut fillings being very hit and miss, and I do at times question the quality control that goes into them. This is something that needs to be addressed because at £1.90 a pop you expect some consistency and it is not the first time I have had next to nothing filling, and I am sure it is not the last!